Worldwide smartphone sales recorded the slowest growth rate since 2013 in the second quarter of 2015, with sales to end users totalling 330 million units, an increase of 13.5 percent over the same period in 2014. “While demand for lower-cost 3G and 4G smartphones continued to drive growth in emerging markets, overall smartphone sales remained mixed region by region in the second quarter of 2015,” says Anshul Gupta, research director, Gartner. Emerging Asia/Pacific (excluding China), Eastern Europe and Middle East and Africa were the fastest-growing regions, driven by good performance from Chinese and local vendors. By contrast, smartphone sales in China fell for the first time year over year, recording a 4 percent decline. “China is the biggest country for smartphone sales, representing 30 percent of total sales of smartphones in the second quarter of 2015. Its poor performance negatively affected the performance of the mobile phone market in the second quarter,” Gupta adds. “China has reached saturation - its phone market is essentially driven by replacement, with fewer first-time buyers. Samsung lost 4.3 percentage points in market share and declined 5.3 percent in unit sales in the second quarter of 2015. Huawei recorded the highest sales growth rate of 46.3 percent, thanks to strong overseas sales and 4G smartphone sales in China. Meanwhile, iPhone sales increased 36 percent, which helped Apple gain 2.4 percentage points in market share. Also, Apple recorded strong iPhone replacements in both emerging and mature markets - and particularly in China - total iPhone sales in China grew 68 percent to 11.9 million units. Apple's double-digit growth in the high-end segment continued to negatively impact its rivals' premium phone sales and profit margins. Many vendors had to realign their portfolios to remain competitive in the midrange and low-end smartphone segments - this realignment resulted in price wars and discounting to clear up inventory for new devices planned for the second half of 2015. In the smartphone operating system (OS) market (see Table 2), Android's global share was affected by the weak performance of China in the second quarter of 2015 and the strong performance in China of Apple, which has taken share from Android for the last three quarters. “Android saw its lowest year-over-year growth of 11 percent with share reaching 82.2 percent in the second quarter of 2015,” Gupta adds. 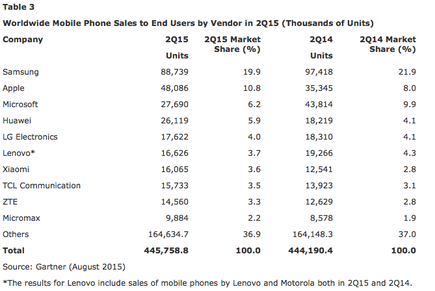 “Microsoft continued to struggle to generate wider demand for Windows Phone devices - even at the lower end. “In light of Microsoft's recent cuts in its mobile hardware business, we'll await signs of its long-term commitment in the smartphone market. Read more Is every employee a digital employee? Worldwide mobile phone sales to end users totalled 446 million units during the second quarter of 2015 - the performance was flat (0.4 per cent) year over year (see Table 3). Vendors that are focused on the emerging markets, such as Huawei, ZTE, TCL Communication and Micromax, benefited from high demand in these markets, while global vendors such as Sony, Samsung and HTC struggled to achieve growth at the high end of the market. Are unmanaged Apple devices a “huge liability” in corporations?